This article was submitted by Courtney Seiter and originally appeared on Buffer’s Open Blog. It has been republished with permission and does not constitute the views or opinions of Skillshare. Prefer to see this as a video? You can find Courtney Seiter’s Class, Build Your Business: Using Company Values to Drive Success | Learn with Buffer, now on Skillshare! At Buffer, our values are a blueprint for everything we do. We use them in hiring, in product decision making, in marketing, in overcoming company challenges and in many other situations. We work hard to make sure that our values aren’t just a plaque on the wall –for one, we don’t have walls because we don’t have an office. But more importantly, values are so key to us that we strive to practice them actively by bringing them into conversations and using them as a lens to look through when we’re looking for answers and perspective. If your company has values that you’d like to be more focused on or aligned around, it’s very possible! Read on for a look at how we at Buffer – as well as some of our favorite companies – practice company values. I hope these examples can help you grow closer to your own company values. Before we get started with practicing values, here’s a quick look at the values that we have here at Buffer to give you an idea of the sorts of things we are thinking about as we’re making decisions. At Buffer, we’ve found that there are plenty of times that it makes sense to reflect on company values and apply them to a situation. These are just a few that we use regularly. Once you get into the habit of using your values as a lens, it’ll be easier every time to lean on them in times when the extra perspective can go a long way. Here are three major ways that we practice our company values at Buffer! We’ve discovered that hiring is an ideal time to keep company values front and center. This is when you’re bringing new people into an existing culture and it’s a great occasion to use your values as a lens to view applicants through. Over the years, we’ve used our values to evolve how we hire and ultimately they have wound up being a key part of our hiring process. In fact, the first interview any candidate goes through is focused specifically on gauging their alignment with Buffer values. After we determine if someone is a values fit, we’ll learn more about their skill set, but the first interview for us is always values-focused. When a candidate is successful in that first values interview, we feel we have found initial “values fit,” which is a slight iteration on “culture fit” that we learned about from Aubrey Blanche of Atlassian. For us at Buffer, this shift in terminology has provided us with a way to stay true to our values and united in the core beliefs that make Buffer the company that we know and love, while also leaving plenty of room for bringing your authentic self to work, including all the perspectives and experiences that make you unique. We are not alone in using values in the hiring process! We greatly admire the way that Zappos has included their values in their process as well. New employees there go through a long training program with a focus on values. If, at the end of the training, they don’t feel aligned with those values, Zappos will pay employees $1,000 to quit. That is a major commitment to their values! Within a product may seem an unlikely place to practice company values, but we’ve been able to use our values regularly when making product decisions. One example of this was getting rid of a much-loved feature when it began to feel dissonant with our core values. Back in 2015, we had to make the tough decision to retire our Suggestions feature. While removing a feature is a big and difficult decision, using values as a lens through which to make decisions brings about a lot of clarity, even in these situations. Suggestions was a feature that pooled content suggestions for all Buffer customers. Essentially any customer could go through and quickly add pre-written content to their Buffer queue. While it was a featured that allowed people to easily fill up their social media feeds, it ultimately led to many people sharing the exact same posts, which didn’t feel like a very authentic experience. By making it so easy to share content through Suggestions, we hadn’t spent as much time encouraging listening as we should have. Although this feature had a lot of great applications, and I’m sure many folks used it to find great content to read thoughtfully and share, we determined that we had made a mistake in the user experience we had created. The product and features that we put out into the world represent who we are and what we stand for, and we couldn’t in good conscience feel comfortable optimizing a user experience that seemed to encourage sharing without reading and contributing to an inauthentic social media experience. Company-wide values have helped inform and guide our marketing culture as well. The ideas put forth in our values can be easily applied in content, social media, community, strategy, and many other places. For example, one of our values is to Choose Positivity. While social media can be a powerful place to voice complaints and criticism, we avoid doing so and keep our channels positive and optimistic. Not only is this living up to our values, but we often get feedback from our community that they appreciate our optimism. Another benefit to sharing values as a team is that it makes it easier to align the whole marketing team with one voice and tone across channels. 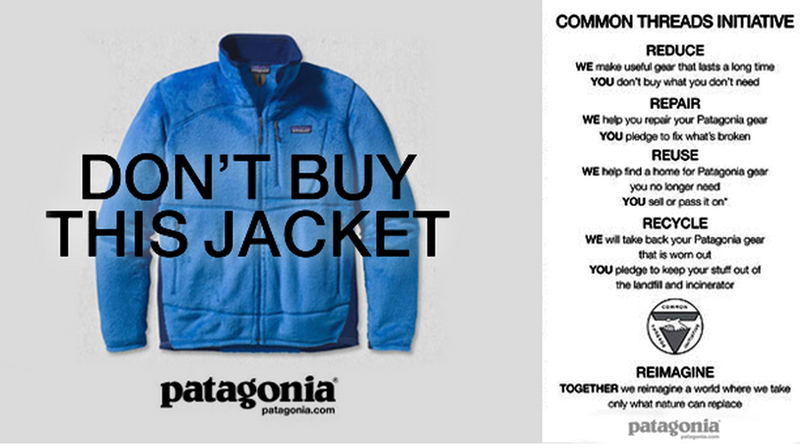 A leader in the space of marketing with values is Patagonia. They ran an entire campaign called “Don’t buy this jacket” where they encouraged their customers to reduce, repair, reuse, and recycle. While it might seem counterintuitive for a clothing brand to discourage consumerism, the campaign aligns strongly with their values and made a big statement. While most of the examples I’ve shared here are from bigger companies, practicing values isn’t just for one size of company, or even only for companies who have had values around for a long time - these apply to any size company or person. No matter what size of organization you are a part of, or even if you’re a solo entrepreneur, setting your values early can be a powerful experience. Working at Buffer and realizing the power of focusing on values encouraged me to develop values for my small social enterprise side business, Girls to the Moon,as well. After our first big event, my cofounders and I holed up in a Chattanooga loft to develop our own set of values. Now, whenever we are faced with conflict or a challenging decision, we immediately go to our values for guidance. There are plenty of opportunities to live your values every day, from small decisions to big momentous moments. Whether you have personal values guiding your freelance or startup career, or organizational values that align you as part of a larger company, what’s important is living with your values, evolving them, and making sure you keep them a part of your decisions to keep them strong. What are your company values and how do you practice them?